www.whidbeyweekly.com LOCALLY OPERATED Teaching Through God’s Word Sundays, 9:00 & 11:00am Calvary Chapel, 3821 French Road, Clinton For more information, visit ccwhidbey.com. Unitarian Universalist Sunday Service All entries are listed chronologically, unless there are multiple entries for the same venue or are connected to a specific organization (such as Sno-Isle Libraries) in which case all entries for that venue or organization are listed collectively in chronological order under one heading. Island Herb Vendor Day Thursday, March 28, 2:00-5:00pm Island Herb, Freeland Representatives from Kouchlock will be on site with product displays and information. Must be 21 or older. Island Herb is located at 5565 Vanbarr Pl, Unit F. For more information, call 360-331-0140 or visit whidbeyislandherb. com. Marijuana has intoxicating effects and may be habit forming. Keep out of the reach of children. Meet the Author, Monika Wieland Shields Saturday, March 30, 11:00am-3:00pm Langley Whale Center, 105 Anthes Ave. Wieland Shields, cofounder and president of Orca Behavior Institute introduces her new book “Endangered Orcas: The Story of the Southern Residents.” The book explains why the Southern Resident Orcas are on the brink of extinction and how we can help! For more information, email wendylsines@gmal.com or check the Event Pages on Orca Network or Langley Whale Center Facebook pages. Labor Wars of the NorthWest Saturday, March 30, 1:30pm The Clyde Theater, Langley Learn about some of the state’s history in this newly released 70-minute historical documentary, followed by a 30-minute discussion and Q&A with the producer. Whidbey Island Roller Girls vs DYDD Trampires Saturday, March 30, 6:00pm Oak Harbor Intermediate School, 150 SW 6th Ave Watch the exciting bout of our local WIRG vs DYDD Trampires! Learn more at WIRG.org. Live Music: Original Jim Sunday, March 31, 4:00pm Bloom’s Winery Tasting Room, Freeland Forged from the vocal jazz and a cappella scenes, and honed on pop, rock, folk, country and blues, Jim sets up a solid foundation for his tunes with creative arrangements, tasty improvisation, a little keyboard, strong vocals, rhythmic guitars and a fresh approach to percussion. No cover. For more information, call 360-321-0515.
climate action today. Featuring resources and information, kids activities, live music and a community of action. Keynote Speaker: Peter Morton. 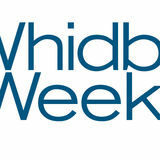 Visit www.whidbeyearthday.org for more details. Star Party Friday, April 5, begins at dark Prairie Overlook next to the Coupeville Cemetery Explore the night sky and view distant galaxies, planets and nebulas at this free public Star Party hosted by the Island County Astronomical Society (ICAS). No telescope is needed and people of all ages are welcome to attend. Be sure and dress warmly and note that the event will be canceled if the weather is cloudy. For more information, contact Bob Scott at ICAS_President@outlook.com, or visit www.icas-wa.org. Jamboree by the Sea and Marine Swap Meet Saturday, April 6, 8:00am-4:00pm Catalina Park, Oak Harbor Marina, 1401 SE Catalina Dr. Hosted by the Deception Pass Sail & Power Squadron, the annual free Jamboree by the Sea will be held from 10:00am to 4:00pm and will include fun children’s activities, marine equipment demos, information booths, fire and rescue demos, paddle boards, boats, full size whale skeleton, FREE hot dogs and chili, and more! For more information about Jamboree by the Sea, email tedmiok@yahoo. com. For more information about the Swap Meet or to RSVP, call Mark Casteel at 360-2401546. The public is invited to meet Chris at one of two free lectures in May: in Langley May 3 at 7:00pm, and in Coupeville May 4 at 7:00pm. Whidbey Reads Presents Raising Awareness & Responding to Domestic Violence Monday, April 1, 2:00-3:30pm Freeland Library Learn to recognize and respond to interpersonal abuse as we discuss the dynamics of domestic violence. Presented by Julie Spangler of Citizens Against Domestic & Sexual Abuse. Steffan Soule’s Magic and Wonder of Reading Tuesday, April 2, 2:00pm Coupeville Rec Hall Be a part of the audience! Be a part of the show! Come see a magic show presented by a magician who learned his art through reading and recommends kids do too! For ages 5 and above. Waste Wise: What is Happening With Recycling? Wednesday, April 3, 2:00pm Freeland Library Do you stand at your recycle bin and wonder if you are doing it right? Are you interested in learning why recycling is changing? Join Sara Bergquist, Educator and Coordinator for the WSU Extension Island County Waste Wise Program. Learn what impact our recycling has and how we can make a difference by recycling right and reconsidering purchasing habits. Movie Night: “Crazy Rich Asians” Wednesday, April 3, 5:30-7:30pm Coupeville Library Join us for popcorn and a movie! This month we are showing “Crazy Rich Asians.” Rated PG-13. Join Sound Water Stewards of Island County on their annual gray whale watching fundraising cruise aboard the “Glacier Spirit.” The $75 per adult fee gives you a two and a half hour cruise, appetizers, beverages and on-board naturalists. To reserve space, sign-up online at http://soundwaterstewards. org/events/whales/ or email events@ soundwaterstewards.org or call 360-6784401. See schedule below Cost: Free Lit for Fun Book Group Thursday, March 28, 9:00-11:00am Freeland Library Join us for a discussion of Gail Honeyman’s “Eleanor Oliphant is Completely Fine,” the smart, warm, and uplifting story of Eleanor and her deadpan weirdness and unconscious wit. For adults. Stories with Sonie Thursday, March 28, 1:00-2:30pm Coupeville Library Read aloud to Sonie, a patient listener and certified therapy dog. Pre-readers and independent readers are welcome. Caregiver required. Supported by the Alliance of Therapy Dogs. Albatross - A Documentary Film by Chris Jordan Thursday, March 28, 2:00-3:45pm Freeland Library Recommended for ages 12 and up. “Albatross” is a powerful visual journey into the heart of an environmental tragedy. On one of the remotest islands on Earth, albatross chicks lie dead on the ground, their bodies filled with plastic. Returning to the island over several years, Chris Jordan and his filming team witnessed these magnificent creatures as a multi-layered metaphor for our times. South Whidbey Community Church Sundays, 9:00-9:45am Adult Bible Study 10:00-11:00am Worship Deer Lagoon Grange, 5142 Bayview Rd, Langley Sunday, March 31: Special Speaker. Services are followed by a light lunch. Charismatic Prayer and Praise group. Everyone welcome. For more information, call Bill at 360-222-4080 or email Sobico@comcast.net. Healing Rooms Every Thursday, 6:30-8:30pm 5200 Honeymoon Bay Road, Freeland The Healing Rooms are open to anyone desiring personal prayer for physical, emotional, or spiritual needs. There is a team of Christians from several local churches that are dedicated to praying for healing the sick in our community. All ministry is private, confidential, and free. Teams are available to pray for individuals who drop by on a first-come, first-serve basis. For more information, contact Ann at 425-263-2704, email healingwhidbey.com, or visit the International Association of Healing Rooms at healingrooms.com. Concordia Lutheran Church Sunday service, 9:30am Bible Study & Sunday School, 10:45am 590 N. Oak Harbor Street For more information, visit www.concordiaoak harbor.org or call 360-675-2548. Sundays, 10:00am Unitarian Universalist Congregation, Freeland All are welcome. Values-based children’s religious exploration classes and childcare will be provided. Visit www.uucwi.org for more information. The Unitarian Universalist Congregation building is located at 20103 Highway 525, two miles north of Freeland. Whidbey Quakers Sundays, 4:00-5:00pm Unitarian Universalist Congregation, Freeland Whidbey Islands Friends Meeting (also known as Quakers) meet in silent worship and community, with occasional spoken messages, every Sunday at the Unitarian Universalist building. For more information, contact Tom Ewell at tewell@whidbey.com or go to www. whidbeyquakers.org. First Church of Christ, Scientist Worship, 10:00am Sunday School to age 20, 10:00am Wednesday Testimony Meeting, 2:30pm Christian Science Reading Room Tuesday & Friday, 11:00am-3:00pm The church and Reading Room are located at 721 SW 20th Court at Scenic Heights Street, Oak Harbor. Call 360-675-0621 or visit christianscience.com Services and Sunday School are also held at 10:30am on South Whidbey at 15910 Highway 525, just north of Bayview and across from Useless Bay Road; testimony meetings are held the first Wednesday of each month at 7:30pm. Thank you for reading! 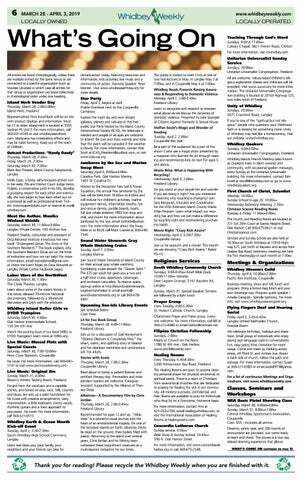 Please recycle the Whidbey Weekly when you are finished with it.